Track your time used on development for each element in smaller solutions.View project time summary or summary for time spent across solutions. 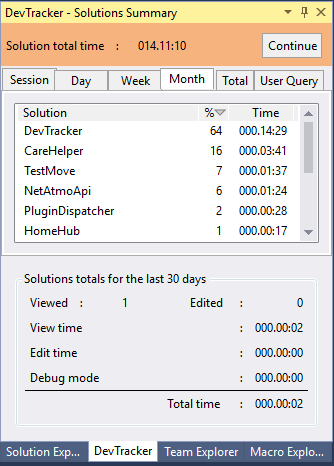 DevTracker – Time Summary is a simple tool to track time used in smaller solutions. Summary is collected for each active element in the solution being viewed, edited or debugged. View project time summary or summary overview of time spent across different solutions. The extension is located in menu View/Other Windows. 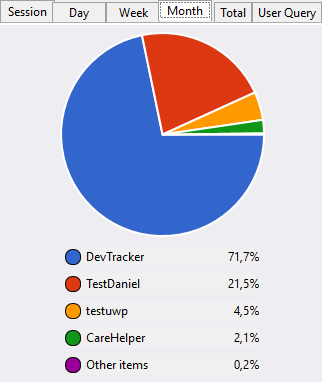 Support for VS 2019. 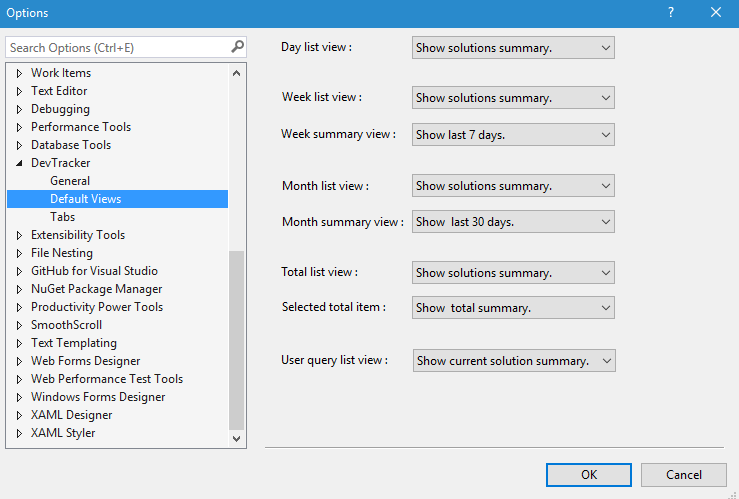 Removed support for VS 2015. Day view for today, yesterday or up to 7 days back. Week view for this week, last week or for the last 7 days. Month view for this month, last month or for the last 30 days. Totals for the entire solutions life span. Summary for time used across solutions in day, week, month and total view. View summary in a detail list or as a pie chart graph. To manually pause or continue time tracking. Push Pause/Continue button or use the keyboard shortcut Ctrl+Shift+D, D. Defaults for idle time can be changed in Devtrackers option dialog. In totals summary information mode. Selecting two or more rows in the list will summarize selected rows. To change between detail list view and pie chart in compact vertical view, double click a tab header item. 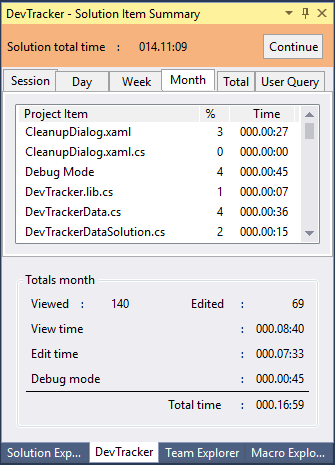 Choose Devtracker/Tabs to select which tabs is visible or to define user query. Sortable columns in the list. Adjustments to the pie chart view. View summary in a pie chart. Handling solution being moved or copied. Auto switch between horizontal and vertical layout. Option for time span format. Export current tab to a CSV file. 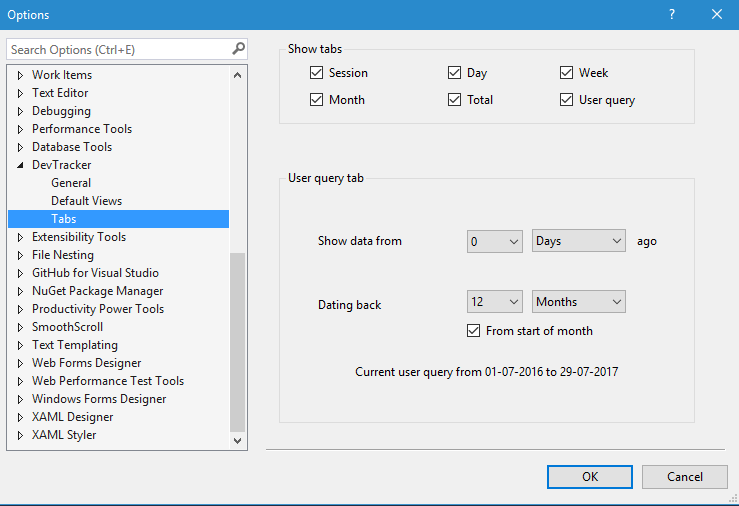 Experimental user defined query tab. Option for selecting which tabs is visible. Summary across solutions was sometime not saved correctly. Non standard projects wasn't handled correctly, like install/setup projects. Summary overview for time spent across solutions. 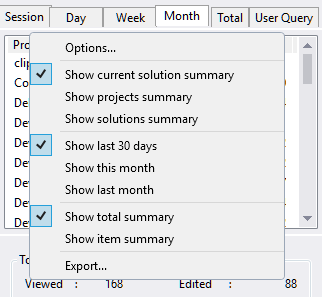 Context menu option to view total or item summary on all tab items. 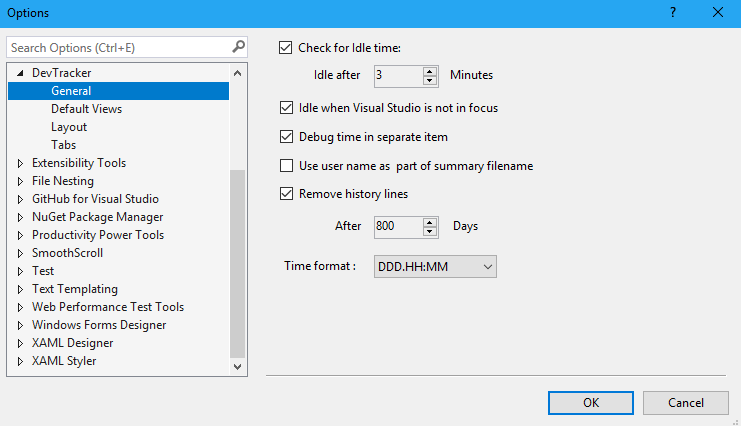 Option to enter idle state when Visual Studio is not in focus.